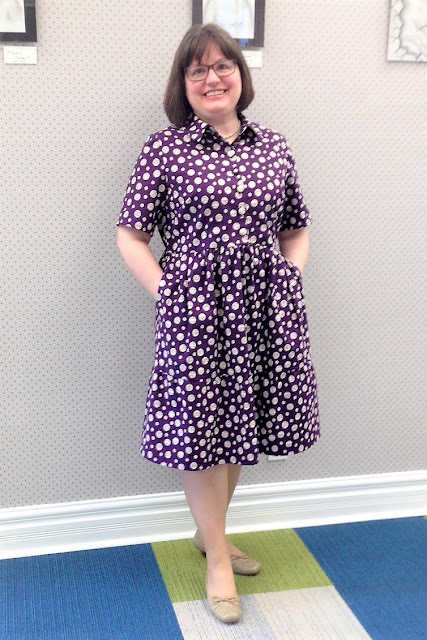 For my most recent dress for the Fabricville Bloggers Project, I chose this very sweet McCalls 7834, a Laura Ashley design. I had my eye on View B (the blue one in the middle) as the most likely to suit me. 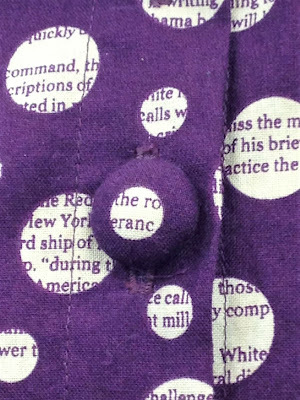 I had also seen this amazing fabric in the Fabricville online store -- it's purple, it is polka dotted, and there is text in those dots! It's everything I love! 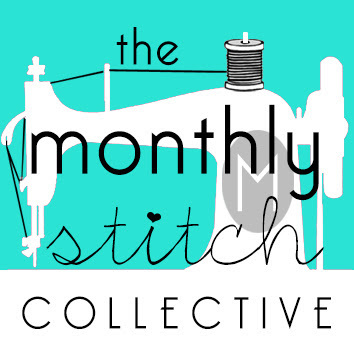 Plus it's a nice weight of quilting cotton, with a tiny bit of stretch to it; I really like using quilting cotton for clothing, despite any snobbishness in the garment sewing world... you just have to select the right pattern for it. I really love how it turned out. The fabric has a nice weight to it, not too heavy but not too thin either. It holds the shape of the skirt really well, with the gathers at the waist and in the lower ruffle. 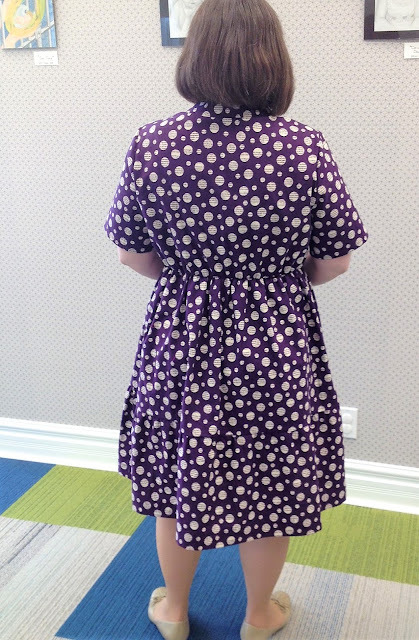 I did alter the skirt quite a bit with the properties of the fabric in mind: I reduced the width of the top ruffle by about an inch on each end of both front and back panels to reduce excess gathers. And the bottom ruffle was supposed to be made of *three* panels -- I immediately chose to reduce that to two panels, with two inches added on to each end. That way the amount of gathering would be more balanced, and more wearable in this stiffer fabric. In a challis or chiffon, the gathering indicated in the pattern would work well. I had to increase the bicep in the sleeve by about an inch as well, and decided after I tried it on to leave the sleeves at a longer length, as I like the effect. And the collar was straightforward, with a nice shape. I also decided to make my own covered buttons for this dress. I didn't want to waste any of this fabulous fabric! 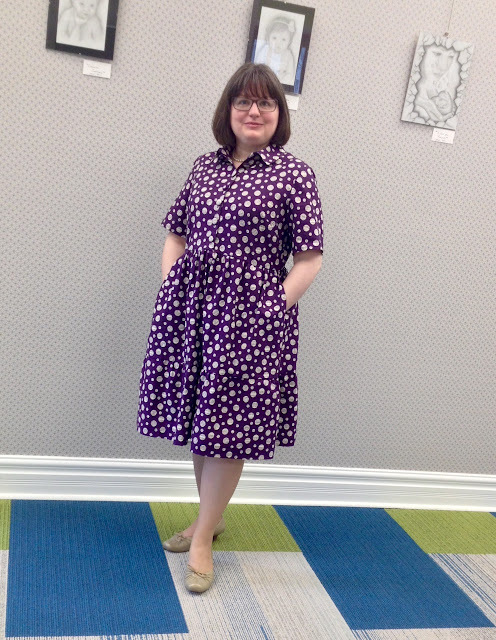 Plus I didn't have any buttons that seemed to work well with this dress, so when I remembered that I'd picked up a covered button set at the thrift store, and they were the right size, it was my immediate choice to use them. I read somewhere that to make really nice covered buttons you should add some padding between the fabric & the button form, so I put a layer of felt in between and it gives them a nice roundness. 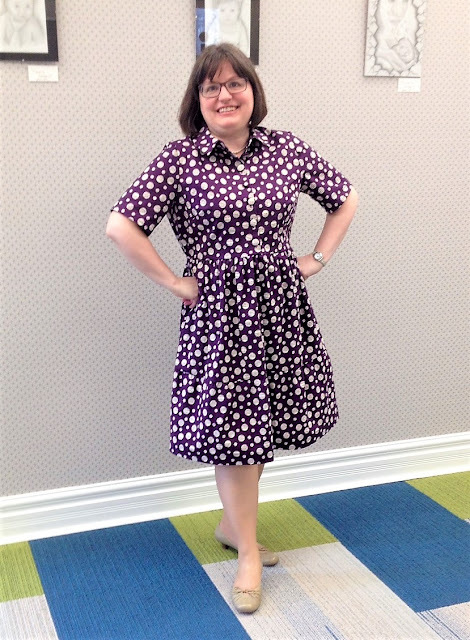 I was in such a hurry to wear this that I didn't get all the loose threads picked off! 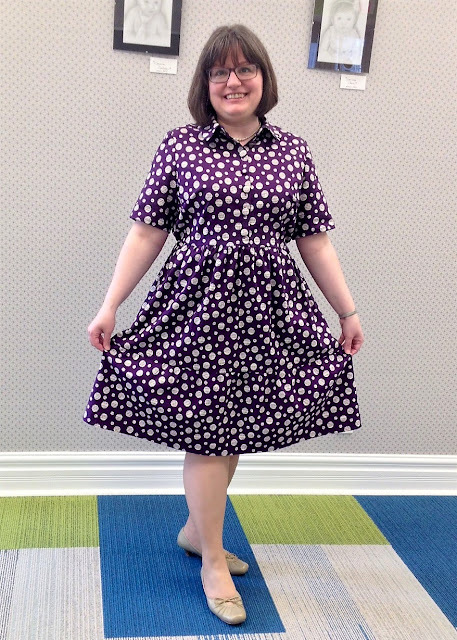 This is rated as an "easy" pattern, and it really is pretty easy! It slips on over the head -- there is an elastic casing in the back waist to gather it up a little but still allow for expansion. Thus the waist is not fully fitted, so if you prefer a very close fitting waist this is probably not the pattern for you. But it's a comfortable fit, and I think the shape is nice enough as it is. 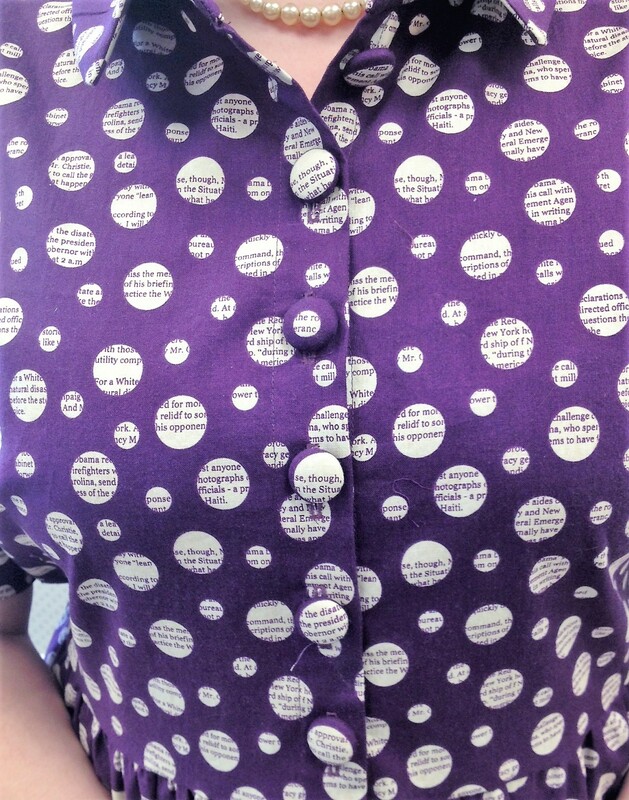 The fabric really appealed to me for the text within the circles. 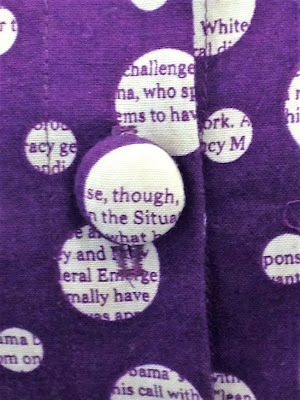 When I received the fabric I realized the text was from a news story -- you can see Obama, Situation, Haiti, Emergency, firefighters, & more in it -- but I'll just pretend that it's found poetry ;) Thank goodness it doesn't say "Trump" anywhere, or I'd have sent it right back. And I just love this fabric! Perfect to wear in the library. Another text based dress for my collection! 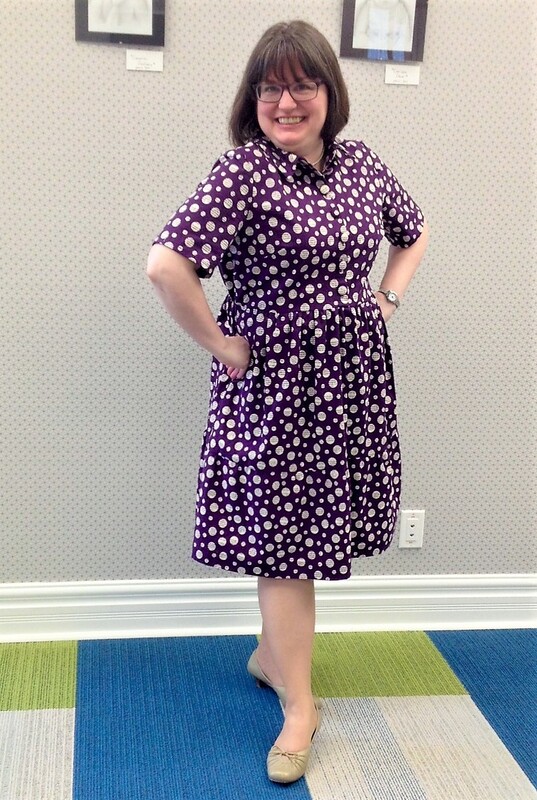 Love it- it's so much fun to have fabrics that link to your job isn't it? 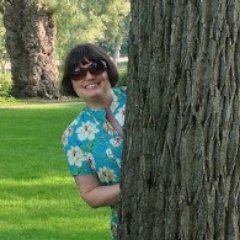 My maths tunic always gets noticed! It is fun 🙂 I always feel slightly like Ms Frizzle in my thematic fabrics - and love it!